The drink was called ‘Kentucky Summer’ — one of six cocktails on the list — a mix of Bourbon, Lillet Blanc, fresh lemon juice and strawberries. Fruity, boozy, unsweetened, it packed a punch. So did the pig’s foot. If you’ve never had trotter, and fancy it stuffed with three pounds of nubbly chorizo, Hooch is here is to make that happen for you. We ordered the dish, can now cross it off the ‘must try’ list, and will stick with other Hooch offerings, like the pretty pink ‘sandwich’ that layers peach brandy-compressed watermelon with slices of Albacore tuna; or the house duck carpaccio, rich with ‘chicken fried’ mushrooms; or the brined, grilled octopus with habanero. Hooch chef, Danny Mongeon, comes to this southern-style place most recently of Gatineau’s Brut Cantina but he’s worked in a few Ottawa kitchens, including Marc Lepine’s Atelier. His obvious affection for the ancient craft of charcuterie and for the modern methods of molecular cooking and ‘nouveau offal’ collide in sometimes brilliant ways. Other dishes seem to lack discipline — a flavour too many, tossed in for shock value. His menu is all over the map, from the comfort cooking (burgers, fried chicken and waffles, and sometimes the ever-controversial horse tartare) to dishes that are delicate, bright, and modern, like a scallop crudo, with orange foam and edible flowers. Some plates are piled high, generous in portion and price, while others are small and over-priced (a petite plate of three scallops for $27). 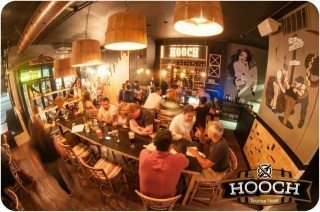 The Hooch look is charming, well thought out, and thrifty-store clever. Edgy murals by Ottawa artist Sarah Doll further personalize the space, in the style of Union Local 613. Service knows the menu well, is relaxed and friendly. Not everything worked at our meal, but more dishes pleased than didn’t. And this place feels real, young and fun — another option for a tray of oysters and a well-made cocktail at midnight on a Monday. Not a thing wrong with that.